Casual English language learners are not much interested in academic writing. They only need to master conversational tone, so advanced written forms are way out of their league. However, if you are a serious learner, who wants to use English in business communication, then essay writing skills are absolutely necessary for you. ESL students often don’t see the point in learning how to compose lengthy papers, since the careers they are after are not based on such skills. However, the practice of academic writing is important because it teaches you how to express yourself with authoritative, believable arguments. That skill will boost your success on any career path! Now that we made the importance of essay writing clear, let’s see how you can master this artistry. In the continuation of this article, you’ll discover the most useful strategies and tools that will make essay writing more attractive and easier for you. Without a clear thesis statement, your paper will be a disorganized, pointless piece of paper. This statement should identify the purpose of your essay, so the reader will immediately know what he is about to read. You cannot just contemplate for few minutes and come up with an awesome statement; this part of the project requires planning! Two of the strategies you can rely on are brainstorming and mind mapping. For brainstorming, you use a piece of paper or an online/smartphone tool to write down everything that comes to your mind. Think about the broad topic and write all ideas you have. Then, you’ll distinguish the best one and use it to proceed with mind mapping. The mind map is a diagram that shows the connection between different concepts. Think about the idea you chose and write all arguments that you can use to support it. Link the arguments between each other and make sure all of them are directly related to the main idea. This mind map will help you form a thesis statement that grasps the essence of your paper. As an ESL student, you may fall into a trap thinking that more complex words would make you seem smarter. When your teachers are evaluating your vocabulary, they are not looking for long words that require a dictionary; they want to see how you can express even the most complex arguments through ideas that everyone can understand. If you want to understand this genre, you should read some of the greatest essays ever written. Although the style of authors like Jo Ann Beard and Annie Dillard may be too complex to understand when English is not your native language, their work will at least inspire you to explore essay writing on a deeper level. Essay Writing is Not Scary When You Rely on the Right Tools! 1. The Purdue Online Writing Lab offers explanations for different types of essays, citation standards, and all details on academic writing you could possibly need. The section for ESL instructors and students covers the basic concepts of writing. That’s exactly where you should start! 2. NinjaEssays will help you complete the most challenging essays. This essay writing service connects you with professional authors who are educated in the topics you are struggling with. Plus, they are trained in essay writing, so you’ll learn how to craft a paper from scratch when you monitor their work. 3. Evernote is one of the best productivity apps out there. You can use it to collect online resources for your essays, take notes or write sections of your paper whenever you get ideas, and connect with people who can provide feedback on your work. 4. Cite This For Me makes referencing less stressful than ever. You must be aware of the dangers of plagiarism; copying practices never lead to successful results. This browser extension will give you correct references of online sources, so you won’t waste time thinking about citation standards. 5. FocusWriter is a distraction-free writing environment that will help you achieve ultimate levels of productivity. The interface is hidden, so you’ll have access to a full screen that’s waiting for your words. 6. Bubbl.us is an online tool that combines brainstorming and mind mapping into one process. It enables you to create a compelling presentation of your ideas. The map will keep you focused through the writing process. 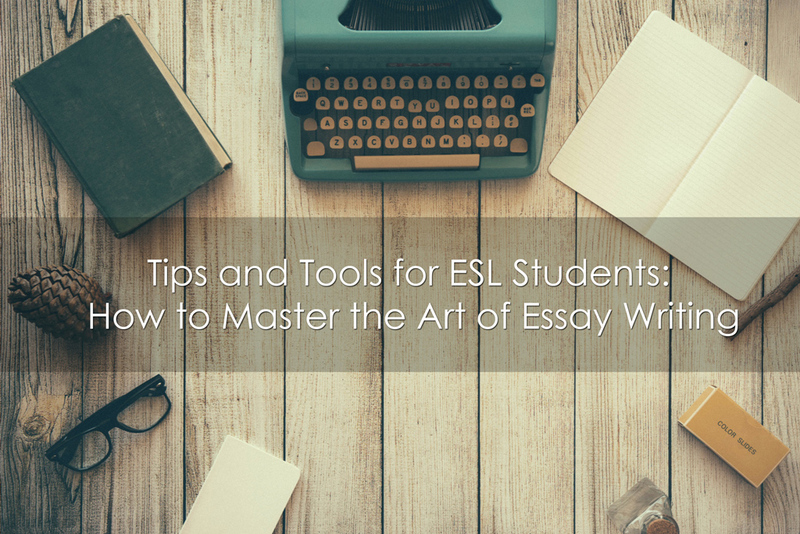 Are You Ready to Start Exploring the Art of Essay Writing? Academic writing can never be easy, especially when English is your second language and you have to discover new terms that make your arguments more believable. However, essays are a necessary aspect of every learner’s journey. You can start writing masterful papers if you learn how to write a strong thesis statement, you simplify the writing tone, and you analyze the pieces of some of the most famous essayists of our time. The Purdue Online Writing Lab, Evernote, Ninja Essays, Cite This For Me, FocusWriter, and Bubble.us are the tools that will support you on that mission. Now that you know how to approach the writing process, it’s time to practice! Start implementing these tips and tools into your writing routine and you’ll immediately notice the difference!